The 5 common interview questions most frequently asked in job interviews. You can almost be 100% sure that you will get asked some or all of these standard interview questions - prepare well and stand out as the right candidate for the job opportunity. Interviewers often begin with the question "Tell me about yourself". It is a tough question to answer because it is so broad and it is difficult to know which information to concentrate on. It is a seemingly informal and friendly question so candidates tend not to prepare for it. This is a mistake, it is very easy to bore the interviewer with irrelevant information. Use these expert interview tips to help you with this one. Know what the requirements of the job opening are. Make sure you have a good understanding of what the company is looking for in a successful candidate. Tailor your answer to highlight how you have the skills and abilities the company is looking for. Keep it to the point - an interviewer will quickly lose interest in a candidate who rambles on about themselves. Stick to about 3 - 5 pertinent points. Start with the strongest benefit you can bring to the job. Be specific by supporting your answer with facts and figures. How to approach this interview question. One of the 5 common interview questions, "Why should we hire you?" requires similar preparation. Match your skills to the job requirements. Look at the competencies needed for success in this type of position. Prepare a statement that clearly demonstrates these skills and competencies. Avoid the type of answers that don't work for this question such as I am a hard worker and I try really hard. These don't tell the interviewer why you, specifically, are the right person for the job. 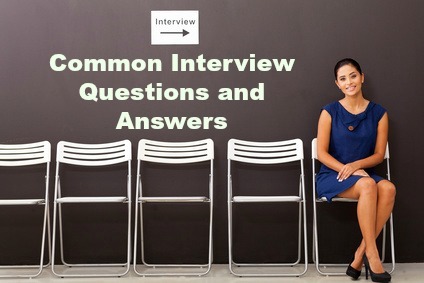 Find sample interview answers to the question Why should we hire you? The old favorite - "What are your strengths and weaknesses?" An effective answer requires you to sit down before your job interview and consider this carefully. Use these helpful tips to prepare. Keep it job-related. The interviewer is not really interested in how good you are at cooking or swimming. Show how your strengths would benefit the job and the company. Avoid falling into the old trap of trying to present a strength as a weaknesses such as I am a workaholic. This is too much of a cliche for credibility. Focus rather on how you are trying to improve a genuine weakness. Find free interview answers to this question. Another of the 5 common interview questions is "Where do you see yourself in 5 years time?" The interviewer is asking this question to see how your expectations fit with the job and the company. Keep it career-related. Discussing plans to travel the world or run a marathon is not what the interviewer is looking for. Avoid specific job titles and exact time frames. Sample interview answers to What are your future goals? This is a standard interview question. The interviewer is checking to see how much you know about the company and if you have really thought about why you would like a job with them. Use these guidelines. Do comprehensive background research on the company before your interview. How do your personal motivations fit in with what you have learned about the company? Use specifics when referring to what it is about the company that appeals to you. Find sample interview answers for Why do you want to work here? Good communication skills are required in almost every job. Prepare for these communication skills interview questions. Take your interview preparation further than these 5 common interview questions and go through the top 10 interview questions you are likely to face in your job interview. View other typical interview questions you may have to answer. 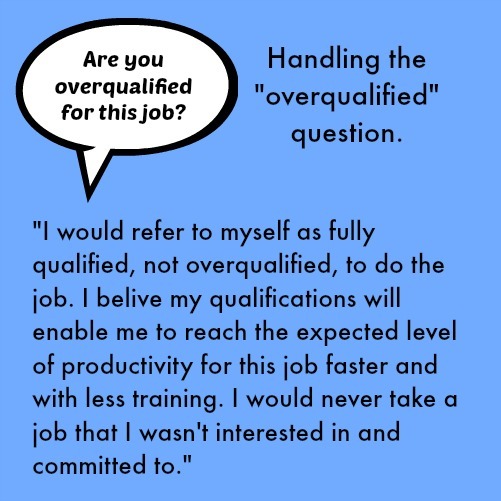 "Are your overqualified for this job?" is a tough question you may face in an interview. Find out how to answer those hard interview questions that can throw you in an interview. It is essential to have prepared a couple of questions to ask the interviewer. Use this list of good interview questions to ask to help you with this.